In C.N. 507, after the prediction’s appearance on pages 5-6 of the book on Kasparov Fighting Chess (London, 1983), we described it as ‘an amazing piece of talent-spotting’. Fighting Chess called the passage ‘the first western report’ on Kasparov. ‘My comment that “England, too, has some possible world class prospects” was a reference to both Julian Hodgson and Nigel Short. It was not until March-April 1975, after Short had performed impressively in Jersey and in a junior event in London, that I rated him ahead of Hodgson, allowing for age, and as a potential rival for Garry Kasparov. At the end of the London event I asked Čenĕk Kottnauer, whose opinion on juniors I regarded highly, to analyse and play a game with Short, and Kottnauer was greatly impressed. The invitation to the Soviet Embassy for Weinstein to play was on my prompting, my grounds being that he would be nervous on his first journey to the West and that Hodgson could gain a psychological edge for battles to come. Moscow refused. 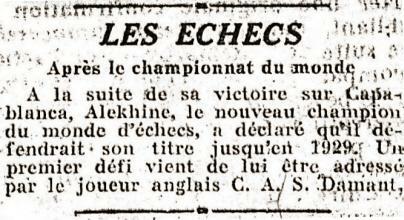 For reasons unexplained, the French newspaper reported that the new world champion, Alekhine, had just been sent a first challenge for his title, by the English player C.A.S. Damant. 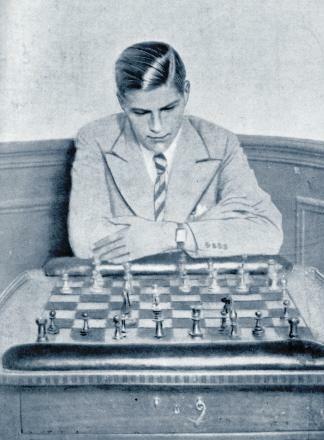 At that time, of course, Andor Lilienthal (born 1911) was unknown to the chess world. As pointed out in C.N. 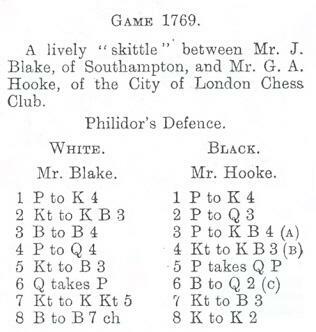 5217, a game-score often wrongly disseminated is ‘Blake v Hooke, London, 1891’: 1 e4 e5 2 Nf3 d6 3 Bc4 f5 4 d4 Nf6 5 Nc3 exd4 6 Qxd4 Bd7 7 Ng5 Nc6 8 Bf7+ Ke7 9 Qxf6+ Kxf6 10 Nd5+ Ke5 11 Nf3+ Kxe4 12 Nc3 mate. ‘This version [i.e. 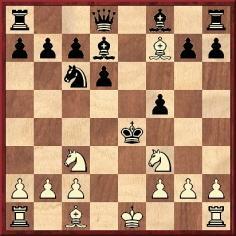 ending with 12 Nc3 mate] appeared, for example, in Chess Sparks [by J.H. 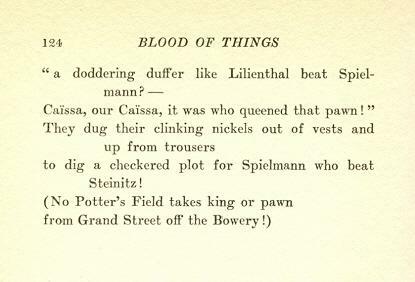 Ellis], published in 1895. 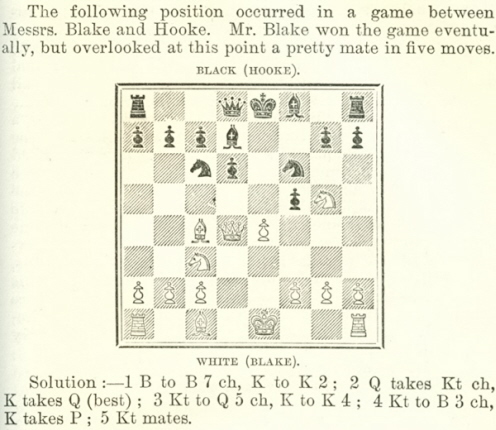 [Ellis’ book merely stated after 7...Nc6 ‘and White gives mate in five moves’.] It was repeated in Julius du Mont’s 200 Miniatures [200 Miniature Games of Chess] but with the dateline of “London 1923”. More serious, however, is the discrepancy that occurred when the game appeared in the British Chess Magazine in 1930. There, after Black’s seventh move, lies the note: “At this point there is [was] a mate in five which White overlooked.” Instead, White played a different line but still managed to sacrifice his queen, according to BCM: 9 Qd5 h6 10 Bg6 Ne5 11 b3! hxg5 12 Qxe5+! dxe5 13 Ba3+ Ke6 14 exf5 mate. Beyond Soltis’ panoply of imprecision (he also put ‘Hook’ instead of Hooke), it is notable that he lifted all the research material, without a word of credit, from the BCM’s Quotes and Queries column (the game having been discussed in items 417, 1457, 3967 and 4078). ‘Has someone else played the “spurious” game 1 e4 e5 2 Nf3 d6 3 Bc4 f5 4 d4 Nf6 5 Nc3 exd4 6 Qxd4 Bd7 7 Ng5 Nc6 8 Bf7+ Ke7 9 Qxf6+ Kxf6 10 Nd5+ Ke5 11 Nf3+ Kxe4 12 Nc3 mate? Roberto Grau gives the same game-score but without names on page 80 of volume I of Tratado general de ajedrez (Buenos Aires, 1939), and the position after 7...Nc6 with the heading “M. Seguin-X” on page 122 of the same volume. The solution is on page 221. To date, no further information has come to light. Edward Winter is the editor of Chess Notes, which was founded in January 1982 as "a forum for aficionados to discuss all matters relating to the Royal Pastime". 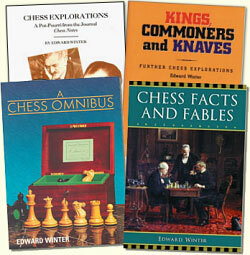 Since then, over 6,300 items have been published, and the series has resulted in four books by Winter: Chess Explorations (1996), Kings, Commoners and Knaves (1999), A Chess Omnibus (2003) and Chess Facts and Fables (2006). He is also the author of a monograph on Capablanca (1989).